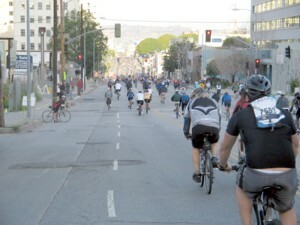 After a nice downhill off the 6th St. Bridge we head north, west, and south, on Central Ave., 3rd St., and Los Angeles St.. The area along Los Angeles St., and eastward to the LA River, and between maybe Temple, on the north, and 7th on the south, encompased an area long known as LA's infamous Skidrow. It was not always as bad as you hear. Once there was a huge Transit Hub near 5th and Los Angeles, where all Mass Transit Bus Agencies, and even Greyhound Busses, came and went, until sometime in the 70's. It had some fine eating there, too. The underground terminal was a mysterious, and entralling, place to a child, and later, teen with a vivid imagination, but toward the end signs of trouble had begun to show themselves, and change came to the area. The area was also called The Warehouse District. The homeless took over, and decay, and crime ruled the streets in some portions. In recent years, City Hall, Law Enforcement, and Business Interests have begun to reclaim the area, by bringing residential lofts to long abandoned historic buildings all over the Downtown, and bringing in restuarants, clubs, and a developing Arts District, as well and, as we rode through, the homeless problem was barely discernable, for 1 day at least. 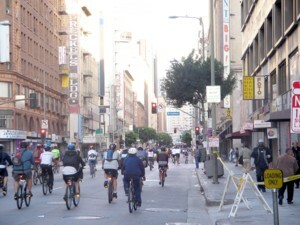 As we passed small groups of the areas poorer residents watching us, watching them, we then headed west on 7th, past the Jewelry District, the second-largest Jewelry District in the nation, after New York, and then up Figueroa to meet up with 6th St. again. I switched gears in time and as I slowly conquered the hill, kept encouraging my fellows not to give up! What even I had forgotten was that 6th, as it heads west into Koreatown, has several hilly stretches, made tolerable by several downhills. As I continued on my merry way I met some interesting folks. There were the many cyclists out for their 1st Tour, and the men, and women, with funny hats. As we rode thru some residential areas we began to realize that the ride would soon be coming to an end. 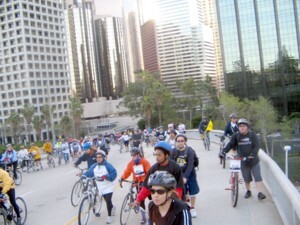 With any ride that has so many participants there are always a few mishaps. Cyclists crash into each other, or crash when going too fast on a crowded downhill. 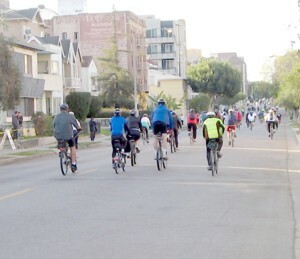 People get so caught up in the experience, and gawking at the scenery, and matters are made more difficult by the fact that many cyclists are not used to riding in groups of other riders. It is amazing that accidents are so few . And then real tragedy strikes when you least expect it. 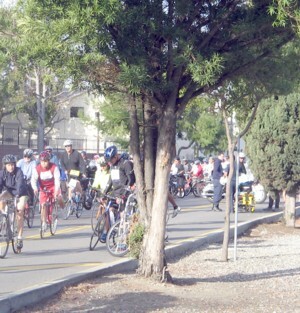 On Expostion Blvd., west of Vermont Ave. a few blocks short of finishing the ride, a bottleneck has developed. As we get off our bikes, and walk past the police, fire truck, and ambulance, we see a downed bike, but no rider. I later learn that the cyclist had suffered a heart attack, and died. Unawares of the true nature of the scene we had just passed excitement built up as we again got on our bikes, and finished the ride. 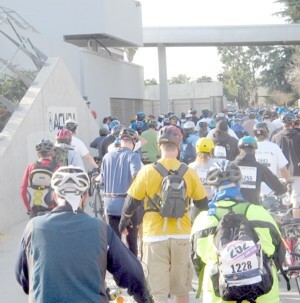 Things slowed down again as we arrived at USC, and everyone got off their bikes to slowly walk into the after ride staging area. Security kept urging us to not stop, but I pulled over to the left out of the the way of traffic and, pleading the cause of the "New Media", asked if i could take a shot for my blog. "Don't stop, keep going... unless you are a blogger taking a picture, then you can stop for just a second! " And so, after 2 hours, exactly, I had finished my 3rd Acura Bike Tour. I was tired, but exhilirated, from the experience. And proud, too, I might add, to have accomplished something that, once published on my Blog, would be something special in my 4 years of sharing my thoughts, and experiences. Next up: The Medal, The Surprise, and The Networking.